According to Ayurveda, Dosha (bio humors) are one of the factors; others are Dhatu (bodu tissue) and Mala (metabolic waste) responsible for the state of health or diseases. Among these Vata, Pitta and Kapha are the Sharirika Dosha (body humors).Vata governs movements, Pitta is concerned with functions of digestion, metabolism and energy production and Kapha governs physical structure, fluid balance and immune response of the body. The natural constitution of the body (Prakriti) is determined by these three Dosha at the time of fertilization. One or more of these three Dosha may dominate in an individual resulting into seven types of body constitutions (Prakriti) i.e. Vata, Pitta, Kapha, Vata-Pitta, Vata-Kapha, Kapha-Pitta and Vata-Pitta-Kapha. This classification of an individual is based on their physical, physiological and psychological characteristics. Different Prakriti individuals have susceptibility for particular disease. As per Sushruta Samhita, Sharira Sthana 4/74, Prakriti of an individual does not change except when the end of life is approaching. Prakriti, the inherent characteristic of an individual refers to the genetically determined physical and mental makeup and is determined by (a) sperms and ovum; (b) forming condition of the uterus; (c) food and regimens of the mother during pregnancy; and (d) nature of predominant Mahabhuta of the fetus. The fetus gets afflicted with one or more of the two Dosha, which are dominantly associated with the above-mentioned factors. Dosha dominating the sperms and ovum during the time of conception determine Prakriti of the individual. Food and regimens of the mother, which aggravates Dosha at that time, also determine the physical constitution. The Dosha that ultimately emerge as dominant factors actually determine Prakriti. Therefore, the knowledge of Prakriti may be important for prevention and better management of diseases. The present study also aims to determine the association of Kapha Prakriti with type 2 diabetes., It also aims to determine whether the Kaphaja Prakriti have an association with MTHFR C677T and A1298C variants or not. The objectives of the study are (1) to determine whether MTHFRC677T and A1298C alleles are associated with Madhumeha (type 2 diabetes) or not, (2) to determine whether Madhumeha (type 2 diabetes) is associated with Prakriti or not, (3) to determine whether MTHFRC677T and A1298C alleles are associated with Prakriti or not. The study was approved by the Ethical Committee of the Institute, faculty of Ayurveda, BHU, Varanasi, and informed consent was taken from each of the participants. A total of 54 type 2 diabetes patients (36 males and 18 females) and 56 normal controls (34 males and 22 females) (matched on geographic origin ethnicity, gender, age, environmental conditions and socioeconomic status) were registered for the study. The age of cases and controls were between 25 and 70 years and the median age of cases and controls was 54 and 44 years. The individuals were registered from the outpatient department and inpatient department and clinical laboratory of the hospital of faculty of Ayurveda, BHU, Varanasi. Detailed clinical examination and medical history were recorded. Additional investigations including plasma glucose level, lipid profile, hemoglobin A1c and urine investigations were also performed. Prakriti of each of the individuals was determined according to questionnaire-based scoring (Cronbach's alpha reliability of the selected questions after Prakriti assessment). Peripheral blood (3–5 ml) was collected for DNA isolation. MTHFR C677T, as well as A1298C genotypes of each of the participants, were determined by PCR followed by restriction digestion using the protocol as described in Kumari et al. Statistical analysis was performed using computer programs quatpsy.org for calculation of Chi-square test and P value and hutchon.net for calculating odds ratio. The selection of cases was done on the basis of fulfillment of diagnostic criteria of Madhumeha (type 2 diabetes). Both male and female patients. Patients above the age of 75 years. 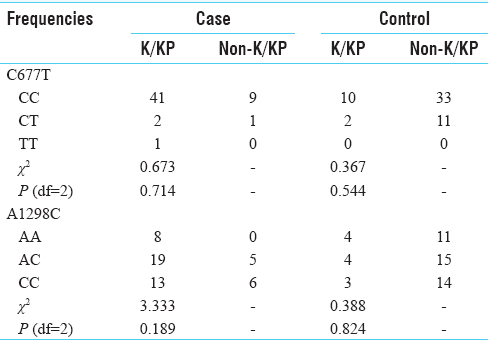 Association analysis was performed between various Prakriti - types and type 2 diabetes, where an extremely strong association between Kaphaja/Kapha-Pittaja Prakriti and type 2 diabetes was observed [Table 1]. The present study revealed a significant association of MTHFR C677T single-nucleotide polymorphisms (SNP) with type 2 diabetes (Chi-square test = 7.743, P = 0.02) where its major genotype “CC” is associated (and not the minor allele) with type 2 diabetes (odds ratio [OR] =3.78, 95% Confidence interval = 1.14–12.45) in the population studied [Table 2]. 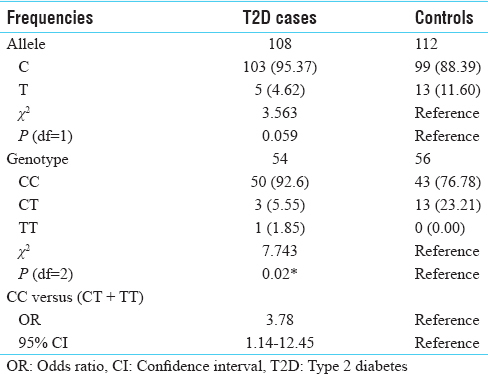 Whereas, MTHFR A1298C was not associated with type 2 diabetes (Chi-square test = 2.264, P = 0.322) [Table 3]. No association was found between any of the Prakriti - types and MTHFR C677T as well as A1298C variants [Table 4]. Being a multifactorial disease, type 2 diabetes is caused due to more than one genetic risk factors together with the effect of extrinsic factors. So far, there have been several genetic risk factors identified for the type 2 diabetes and still being unravelled. The frequency of T allele of MTHFR C677T observed in type 2 diabetes cases was lower than that of normal controls. Although this difference was not significant (P = 0.059). Other studies on Indian populations have also documented the lower frequency of this allele.,,, The frequency of MTHFR gene mutation is quite variable in different geographic and ethnic groups. The genotype frequency of MTHFR C677CC described in the different populations fluctuates between 40% and 49% as in type 2 diabetes cases of Turkey (49%), Tunisia (45%), Brazil (46%) and China (44%).,,, In the present study, the CC frequency was 92.6%. There are a very few studies on MTHFR and type 2 diabetes., Variable results are found for the association of MTHFR C677T with type 2 diabetes. This variability could be due to population-specific genetic variations and effect of their environment. Most of the studies have shown T allele as a risk for type 2 diabetes in Caucasian populations and found a significant association between MTHFR C677T polymorphism and type 2 diabetes in Moroccan population with a significant difference in the T allele frequency between the diabetic and control groups (26.06% vs. 33.20%, respectively). However, this group also did not find an association between A1298C polymorphism and type 2 diabetes. Lunegova et al. studied among ethical Kirghizes that the frequency of CT and TT genotypes was significantly higher in patients with insulin resistance than in controls (P = 0.027). 677T allele was also associated with obesity, hypertriglyceridemia and low level of high-density lipoprotein cholesterol. A study from Taiwanian population has shown that T is not a risk to type 2 diabetes. No significance difference in the distribution of MTHFR genotypes between healthy and type 2 diabetes individuals is found in Taiwanese patients. Besides, no significant associations between lipid/glucose metabolic indices with MTHFR genotypes among diabetic patients are observed. Whereas similar to results; a study from Indian population has shown that CC is a risk for type 2 diabetes. This suggests that probably CC has different effects depending on other genetic modifiers and extrinsic factors. Prasher B and others observed that individuals from the three (Vata, Pitta and Kapha) most contrasting constitutional types exhibited striking differences with respect to biochemical and hematological parameters and at genome-wide expression levels. They also reported that biochemical profiles such as liver function tests and lipid profiles and hematological parameters like hemoglobin levels exhibited differences between Prakriti types. Thus, they concluded that Ayurveda-based method of phenotypic classification of extreme constitutional types may be utilized to uncover genes that may contribute to physical, physiological and psychological differences in normal individuals and their susceptibility to the diseases. MTHFR A1298C shows variable results in different studies. In the present study, it was not associated with type 2 diabetes. In the present study, an extremely strong association between Prakriti (Kapha/Kapha-Pittaja) and type 2 diabetes (P < 0.00001) was detected. This is the first study at the molecular level that confirms the Kaphaja Prakriti individuals are highly prone for diabetes. There is one more report confirming the association of Prakriti with clinical phenotypes (cardiovascular risk factors, inflammatory markers, and insulin resistance). Mahalle et al. and the present study gives a strong clue for the association of Prakriti (body constitutional type) and clinical phenotype. This will strongly help in the prevention and management of type 2 diabetes. This could be because these variants may not contribute to the constitution of Prakriti type, at least in this population. It is further required to test the association of Prakriti and genetic make-up at the whole genome level. In present study, the major 'C' allele showed an association with type 2 diabetes in the present Indian population studied. However, no significant association was found between another SNP MTHFR A1298C and type 2 diabetes in this study. MTHFR variants did not show association with the Prakriti in the present study. The analysis on larger sample size from other Indian cohorts on type 2 diabetes is required to confirm the association findings. The inclusion of samples from other cohorts of Indian populations should also be incorporated in further studies on larger scale. The present study will provide a way to further analyze the association status of MTHFR SNPs with type 2 diabetes as well as Prakriti. Hankey A. A test of the systems analysis underlying the scientific theory of Ayurveda's Tridosha. J Altern Complement Med 2005;11:385-90. Dwarakanath C. The Fundamental Principles of Ayurveda. Part III. Reprint edition. Varanasi, India: Krishnadas Academy; 2009. p. 102. Sharma RK, Bhagvan D, editor. Charaka Samhita of Agnivesha. Vimana Sthana. Ch. 8, Ver. 95. Reprint Edition. Varanasi: Chowkhamba Prakahsan; 2007. p. 262. Longo DL, Fauci AS, Kasper DL, Hauser SL, Jameson JL, Loscalzo J. Diabetes Mellitus. Harrison's Principles of Internal Medicine. James H. McGraw John A. Hill., Pennsylvania Plaza, New York City; 2012. p. 2968-3002. Boon NA, Colledge NR, Walker BR. Diabetes mellitus. In: Davidson's Principles & Practice of Medicine. Edinburgh, UK: Churchill Livingstone Elsevier; 2006. p. 805-47. Prescott NJ, Winter RM, Malcolm S. Maternal MTHFR genotype contributes to the risk of non-syndromic cleft lip and palate. J Med Genet 2002;39:368-9. Mann NJ, Li D, Sinclair AJ, Dudman NP, Guo XW, Elsworth GR, et al. The effect of diet on plasma homocysteine concentrations in healthy male subjects. Eur J Clin Nutr 1999;53:895-9. Settin A, El-Baz R, Ismaeel A, Tolba W, Allah WA. Association of ACE and MTHFR genetic polymorphisms with type 2 diabetes mellitus: Susceptibility and complications. J Renin Angiotensin Aldosterone Syst 2015;16:838-43. Zhang D, Zhou Y, Han L, Ji H, Li J. The effect of MTHFR C677T polymorphism on type 2 diabetes mellitus with vascular complications in Chinese Han population: A meta-analysis. Endocr J 2014;61:717-26. El-Baz R, Settin A, Ismaeel A, Khaleel AA, Abbas T, Tolba W, et al. MTHFR C677T, A1298C and ACE I/D polymorphisms as risk factors for diabetic nephropathy among type 2 diabetic patients. J Renin Angiotensin Aldosterone Syst 2012;13:472-7. Chang YH, Fu WM, Wu YH, Yeh CJ, Huang CN, Shiau MY, et al. Prevalence of methylenetetrahydrofolate reductase C677T and A1298C polymorphisms in Taiwanese patients with type 2 diabetic mellitus. Clin Biochem 2011;44:1370-4. Sun JZ, Xu Y, Lu H, Zhu Y. Polymorphism of the methylenetetrahydrofolate reductase gene association with homocysteine and ischemic stroke in type 2 diabetes. Neurol India 2009;57:589-93. Al-Rubeaan K, Siddiqui K, Saeb AT, Nazir N, Al-Naqeb D, Al-Qasim S, et al. ACE I/D and MTHFR C677T polymorphisms are significantly associated with type 2 diabetes in Arab ethnicity: A meta-analysis. Gene 2013;520:166-77. Sukla KK, Raman R. Association of MTHFR and RFC1 gene polymorphism with hyperhomocysteinemia and its modulation by Vitamin B12 and folic acid in an Indian population. Eur J Clin Nutr 2012;66:111-8. Kumari P, Ali A, Sukla KK, Singh SK, Raman R. Lower incidence of nonsyndromic cleft lip with or without cleft palate in females: Is homocysteine a factor? J Biosci 2013;38:21-6. Acharya YT, editor. Charaka Samhita by Agnivesha, Sutra Sthana. Ch. 10, Ver. 11. 5th edition. Varanasi: Chaukhamba Prakahsan; 2007. p. 205. Kumar S, Byadgi PS. Critical appraisal of Madhumeha (diabetes mellitus). Int J Res Ayur Pharm 2011;2:687-93. 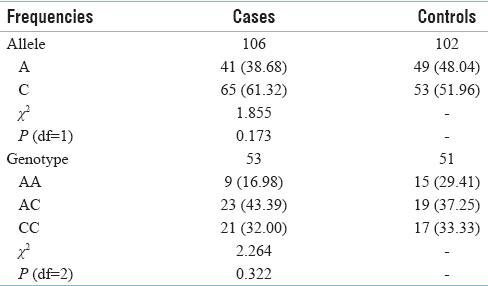 Ali A, Singh SK, Raman R. MTHFR 677TT alone and IRF6 820GG together with MTHFR 677CT, but not MTHFR A1298C, are risks for nonsyndromic cleft lip with or without cleft palate in an Indian population. Genet Test Mol Biomarkers 2009;13:355-60. Abbas S, Raza ST, Ahmed F, Ahmad A, Rizvi S, Mahdi F, et al. Association of genetic polymorphism of PPARγ-2, ACE, MTHFR, FABP-2 and FTO genes in risk prediction of type 2 diabetes mellitus. J Biomed Sci 2013;20:80. Khodaeian M, Enayati S, Tabatabaei-Malazy O, Amoli MM. Association between genetic variants and diabetes mellitus in Iranian populations: A systematic review of observational studies. J Diabetes Res 2015;2015:585917. Lunegova OS, Kerimkulova AS, Turdakmatov NB, Sovkhozova NA, Nabiev MP, Isakova ZhT, et al. Association of C677T gene polymorphism of methylenetetrahydrofolate reductase with insulin resistance among Kirghizes. Kardiologiia 2011;51:58-62. Prasher B, Negi S, Aggarwal S, Mandal AK, Sethi TP, Deshmukh SR, et al. Whole genome expression and biochemical correlates of extreme constitutional types defined in Ayurveda. J Transl Med 2008;6:48. Mahalle NP, Kulkarni MV, Pendse NM, Naik SS. Association of constitutional type of Ayurveda with cardiovascular risk factors, inflammatory markers and insulin resistance. J Ayurveda Integr Med 2012;3:150-7.